The Lenovo IdeaCentre A720 big-screen all-in-one PC measures 27 inches diagonally. But it's also thin, with a display thickness of 24.5mm (0.97 inch), which Lenovo is claims makes it the world's thinnest. Adjusting to the dimensions can be kind of tricky: When I walked in to Lenovo's booth, I couldn't get over the size of the screen--and the thin frame makes the whole thing all the more deceptive. But there it is: thin, massive, and impressively configured with a Core-i7 Sandy Bridge CPU, 8GB of RAM, up to 1.8TB of storage space (with solid-state drive options), a 2GB discrete graphics card, and a slot-loading BluRay player. 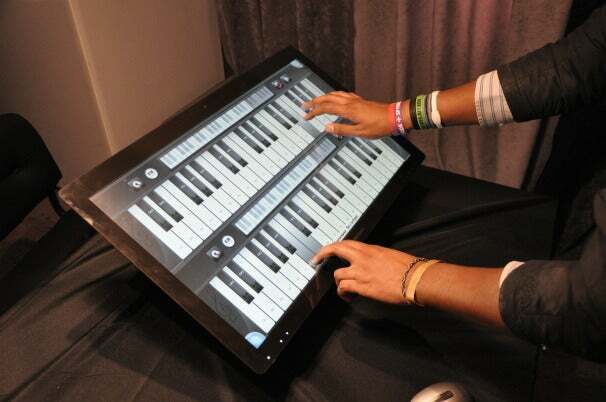 The screen has a maximum resolution of 1920 by 1200 pixels; and fittingly for an All-in-One, it supports ten-finger multitouch. Its weight seems a bit on the heavy side, but the solid metal chassis is gorgeous, with an attractive, clean finish. Like the Vizio all-in-ones that I saw earlier today, this PC has its innards tucked into the base, allowing the screen to achieve its superslim profile. 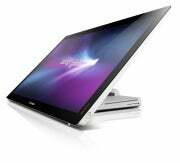 Unlike Vizio's stationary machines, the A720 has its screen attached to an articulating arm, so the screen can slide down at an angle to make onscreen typing more convenient. It can also lie entirely flat, like a touch-table for playing touch-enabled games--or for work, if you're into that sort of thing. Overall, it's reminiscent of the HP TouchSmart 610--albeit in a larger, thinner form--especially because both incorporate a logical and perhaps inevitable development in all-in-one PCs. Holding your arms in the air to get things done is uncomfortable at best. Using a sliding screen alleviates some of that discomfort, but laying the screen entirely flat is a neat extra step, and should get even better as more game developers take advantage of touchscreen-enabled PCs--a virtual certainty with Windows 8 on the horizon. The machine comes bundled with a wireless keyboard and mouse. Both of these plastic peripherals are slim, which is nice, but set next to the gigantic metal beauty of the PC, they are a bit disappointing. First Vizio, and now Lenovo. More of this, please, PC manufacturers. As components get smaller and better at dissipating heat, design choices of the type adopted here become easier to realize. And that's good news for anyone who wants a desktop PC that's worth showing off. The Lenovo IdeaCentre A720 is a strong choice for lovers of digital, and great for board-style gaming, but there more economical choices available.